PHUKET: Seven Phuket Vocational College students robbed of their mobile phones at knifepoint on Thursday will be reunited with their devices, thanks to the efforts of the Phuket City Police. Officers led by Phuket Provincial Police Commander Pekad Tantipong yesterday presented the two young men to be charged with the robbery – Surachet ‘Um’ Pisetsin, 19, and his 17-year-old alleged accomplice, wearing a balaclava to protect his identity – to a press conference yesterday afternoon. Also presented were the seven stolen cell phones, together with the knife and Phang Nga-registered motorbike allegedly used to carry out the theft. Phuket City Police Superintendent Wanchai Ekpornpit said the youths robbed the seven students, who had gathered beside Klong Bangyai at Saphan Hin. The youths reported the incident to police, who arrested Mr Surachet after he tried to sell the devices to Ruampon Mobile, a cell phone shop on Phatthana Thong Thin Road in Wichit. 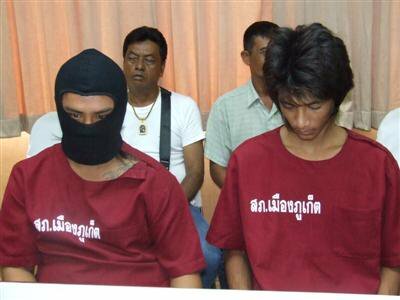 The pair will be charged with conspiracy to commit armed robbery using a motorbike and weapon, police said.